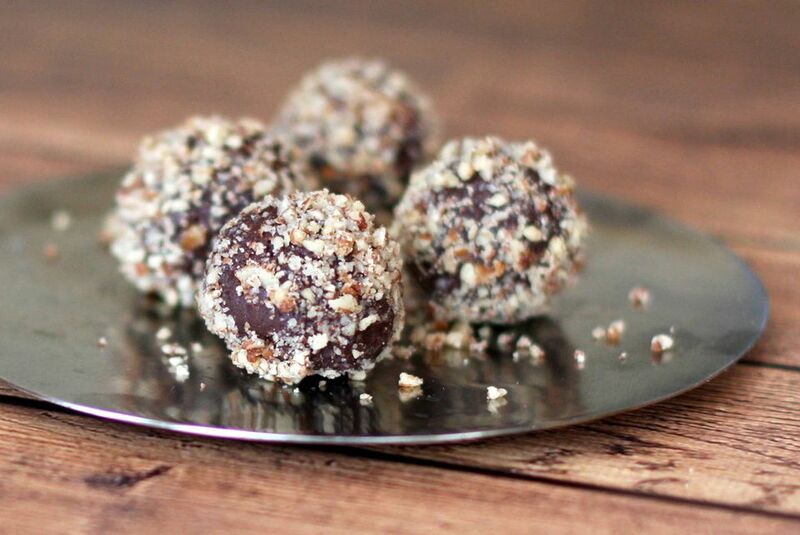 Sweetened condensed milk and chocolate chips make these truffles quick and easy to prepare, and they can be made with a little more bourbon and less vanilla if desired. They are incredibly easy to fix, and can be coated with your choice of pecans, plain granulated sugar, or unsweetened cocoa powder. Feel free to omit the bourbon for alcohol-free truffles. The truffles are similar in flavor to bourbon balls, but without vanilla wafers. Combine chocolate chips and sweetened condensed milk in a saucepan over low heat. Heat, stirring, until melted and smooth; remove from heat. Stir in the vanilla, bourbon, and 1/2 to 3/4 cup pecans. Transfer to a small bowl. Cover and chill for 3 to 4 hours, or until mixture is firm. Working with fingertips, shape into 1-inch balls; roll in finely chopped pecans, sugar, or unsweetened cocoa. Place on a tray or baking sheet, cover loosely, and chill for at least 1 hour. If desired, put each truffle in a decorative fluted paper or foil cup and keep in tightly covered container in the refrigerator until giving or serving. Keep these refrigerated, tightly covered.